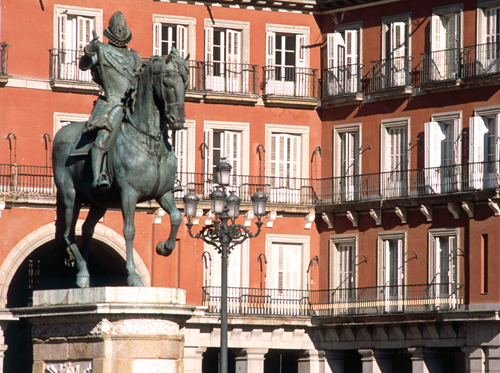 Madrid’s most famous square was built on a grand scale. Capable of holding up to 50,000 people, it was intended to impress and still does. Nowadays it’s a tourist attraction first and foremost: a place for relaxing over a drink and watching the world go by. Originally known as Plaza de Arrabal (“Outskirts Square”) because it lay outside the city walls, Plaza Mayor was completed in 1619. 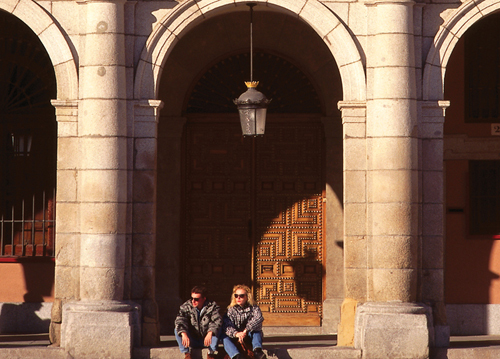 Following a fire in 1791, Juan de Villanueva (architect of the Prado) redesigned the square, adding the granite arch-ways that now enclose it. During its history, Plaza Mayor has been a market, an open air theatre, a bullring, a place of execution, and a backdrop for tournaments. Its buildings are now mainly used by the city government. 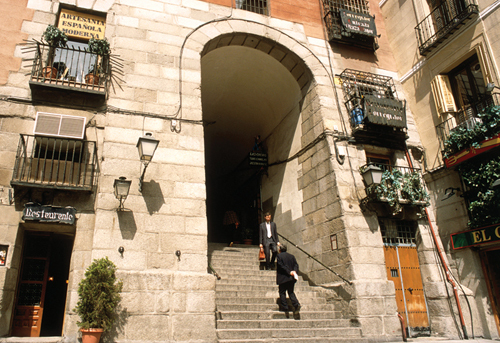 The cellars of Moore’s Irish bar (Calle Felipe III) were once used by the Inquisition to torture the accused until they confessed to heresy, witchcraft and a multitude of other crimes. Once condemned, they had to undergo a ceremony known as the auto-de-fé before being handed over to the secular authorities for punishment. This macabre spectacle, which included a ritual procession and public humiliations, lasted from dawn to dusk. 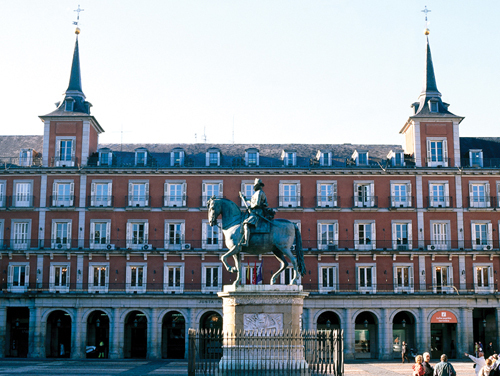 The Plaza Mayor witnessed four autos-de-fé between 1624 and 1680. 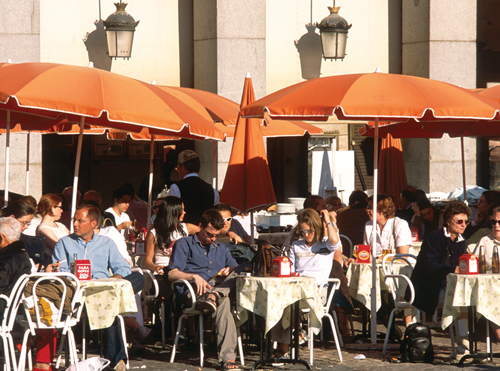 Stock up for a picnic on one of the square’s benches in the nearby Mercado de San Miguel. The painted enamel street signs for which Madrid is famous provide a clue to the original inhabitants, such as Calle de los Botoneros (Buttonmakers’ Street). This magnificent statue by two Italian artists, Pietro Tacca and Giambologna, was moved here in the 19th century. Presented to Felipe III in 1616 by the Florentine ruler Cosimo de’ Medici, it was originally in the Casa de Campo. This house was the headquarters of the bakers’ guild, which had enormous power controlling the price of grain. The portal survives from the original building which burned down in 1672. 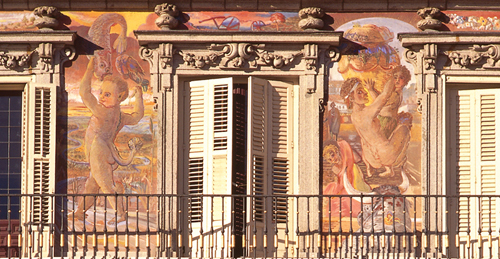 In the 1980s it was decided that the façade murals were past saving and a competition was held for a new design. The winner, Carlos Franco, painted allegories of the zodiac signs in 1992. The Casa de la Carnicería was originally the meat market. Outside was a gallows where criminals were executed. Next door to the building is the main tourist office. “Cutlers” Arch is a reminder of the sword makers and knife grinders who once plied their trades here. Today the street is famous for mesones (taverns) such as Las Cuevas de Luis Candelas, named after a 19th-century bandit said to have hidden in its cellars. When the houses were built on this street adjacent to Plaza Mayor, huge quantities of earth were removed from the foundations of the square. To prevent its collapse, frontages on the Cava were designed as sloping buttresses. Buying and selling has always been the life blood of Plaza Mayor. At El Arco de los Cuchilleros (No. 9) all the items on sale have been made by local artisans, continuing a centuries-old tradition. Bars and restaurants put out tables in the summer months and relaxing over a drink is the best way to appreciate the square. Look out for the speciality bocadillo de calamares (bread roll filled with squid). 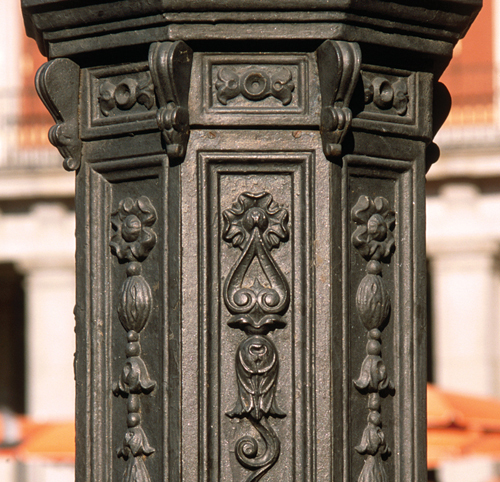 The modern lamp-posts around the statue of Felipe III are engraved with scenes depicting life on the square in days gone by. They include a masquerade ball, an interrogation by members of the Inquisition and a bullfight. Something of a tradition, this market takes place every Sunday morning from around 10am to 2pm and attracts amateur and expert collectors from all over Spain. Otherwise enthusiasts should head for the specialist shops on Calle Felipe III, Calle Mayor and outside the Arco de Toledo.